Home > Freelancers & Contractors > Questionnaire: Does My Contract Fall Inside IR35? IR35 is one of the most important considerations for any contractor. Introduced with the intention of properly taxing 'disguised employment', it has actually led to significant expense and difficulty for genuine Contractors And Freelancers. There are many 'IR35 compliant' contracts available on the internet. These should be avoided at all costs. A standard contract will serve neither you nor your client well, nor is it likely to pass IR35, as just as much emphasis is put on the actual working patterns of the contractor as on the wording of the contract. You only stand a chance of passing IR35 if you hand-craft a contract that clearly positions you as a non-employee. This questionnaire should help you decide whether your contract falls inside or outside IR35. 1. Has HM Revenue and Customs judged that a previous contractor performing the same work has fallen inside IR35? While this is not directly related to your contract, it is a vital starting point. Your client may be able to give you an answer. 2. Is there mutuality of obligation? Is the client obliged to offer you work, as an employer would an employee? Similarly, are you obliged to take on work after the expiration of your contract? 3. Will the client provide equipment? Many standard contracts stipulate that the client will provide the equipment necessary for you to do your job. This might include a computer or machinery. 4. Does the contract stipulate a set monthly fee? If you are on a potentially lengthy contract, it may include provision for a standard fee paid every month, in the same way as you would receive a salary. 5. Does the contract stipulate that you will be paid via payroll? Many contracts either do not mention alternative payment methods, or state that you will be paid via the client's payroll system. 6. Will the client deduct your tax payments? Frequently, contracts fail to mention tax arrangements. Less frequently, they will stipulate that Income Tax and National Insurance contributions will be deducted via the client's PAYE system. 7. Is it specifically you who must complete the work? Many contracts do not include a clause allowing the contractor to provide a substitute if they are unable to complete the work. 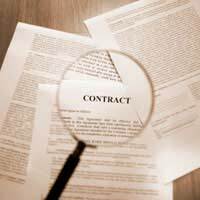 8.Does the contract state specific hours that you will work? This might include number of days worked, hours at which you will start and finish, and when you can take breaks. 9. Are you entitled to employee benefits? This need not be as significant as a pension; it might include use of the company canteen, for example. If you have answered 'yes' to one or more of these questions, your contract will almost certainly be subject to IR35. This can be hugely expensive from a tax perspective. However, if you are only contracting for a short period, or if you only intend to contract once, you may be better off falling inside IR35 and avoiding the work and expense of arranging an alternative. More information on ensuring that your contracts fall outside IR35 can be found in articles elsewhere on this site.